Almost two months ago the prototype for what became known as the Thermalright Ultra-120 eXtreme showed up on our doorstep. The review of the excellent Ultra-120 was just finished and that cooler moved to the top of our performance charts along with the Tuniq Tower 120 and some specialized configurations of a few other coolers. 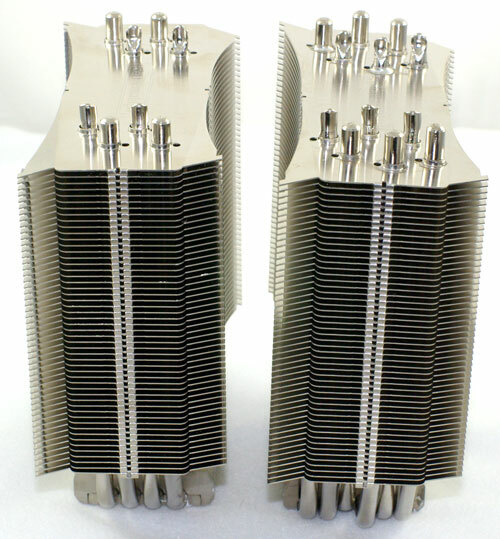 The eXtreme added two more heatpipes, for a total of six, but it was otherwise just like the Ultra-120 as far as we could tell. We didn't expect that much improvement over the already excellent Ultra-120, but many of you will recall that the prototype tested in the Thermalright Ultra-120 eXtreme preview set new records in air cooling. This was clearly the best air cooler ever tested in the AnandTech labs. The cooler prototype was not perfect, however. There was what we considered a major issue with the socket 775 mount, which needed to be bent to fit between the heatpipes and then straightened again. We suggested this needed to be fixed by Thermalright for the production version of the eXtreme. It has been almost two months since our first look at the Thermalright Ultra-120 eXtreme, and the cooler is now in full production at Thermalright. You should start to see units for sale in the next few days. Thermalright advised us that they have fixed the issue with the socket 775 adapter. We were also advised that several minor refinements were made in the design of the eXtreme. Normally the availability of the production part would merely be a comment to another article or something for AnandTech Forum discussions. However, this cooler has generated a huge amount of interest simply because it performed better than any we have tested. For that reason, we felt we should take another look at the production unit, to make certain the mounting was corrected and to confirm the outstanding performance we first saw in the prototype. Thermalright offered to ship us a retail production unit, so this is an update based on the production Ultra-120 eXtreme. We also retested the production unit to see if a second Thermalright Ultra-120 eXtreme - this one a retail unit - would perform just as well as the eXtreme prototype. We even tested with the same Scythe S-FLEX fan used in our first tests. Coolers are less subject to production changes that degrade performance than motherboards are; we have at times found great prototype motherboards that proved less than stellar when finally in full production. For our readers, we felt a second test would confirm that the Thermalright Ultra-120 eXtreme you buy will deliver the same chart-topping performance than we found in testing at AnandTech, so today we are testing the retail production sample. While not being tactful, I have to agree with TA152H's comments. Not providing enough factual details and ensuring all measures are taken to accurately review a product leave doubt in the reader. I have spent quite a bit of time across 10 websites for reviews of computer parts over several years and the reviewers that take all accounts and variances and explain those in every review are the ones I tend to believe are accurate. Please take comments directed at your review seriously and try to find the meaning behind the sometimes harsh words and it will help you become a more respected reviewer. Kudos on the writing, I detect style and skill but the ambiguous message is not something the audience likes to see. "Consider the audience". I'm willing to bet, if someone is actually researching a fan for their computer, their probably VERY detail-oriented as the majority of the public would only research heavily marketed motherboards or the latest Intel processor. I bought an Ultra-120 Extreme and a Nexus case fan to cool it. plus two 3-pin case fan connectors. The Nexus has a 3-pin fan connector and a 4-pin accessory-type power connector. so the sw can control the Nexus fan speed? I guess I could connect the Nexus to the motherboard's 3-pin fan connectors. But I assume the 4-pin cpu fan connector is optimized to cool the cpu. Can someone tell me what the 4th pin in the cpu fan connector is used for? And how to connect the Nexus 3-pin fan connector to the motherboard 4-pin cpu fan connector? i have trouble looking at this article as if it were objective. i can't say exactly why, it just seems like the numbers were altered to suit some conclusion. it might just be accurate and me being a fool, highly likely... but still, there's missing info that i can't say has me convinced. Thermalright is one of the very few companies that has delivered quality products and customer support for years. They are the gold standard of the PC industry IMO. Every other company - especially the Asian mobo companies could learn a lot about product design, engineering, quality control and customer service from Thermalright. I just *have* to mention this for potential buyers.. I bought the non-extreme version a week or 2 back coz I was tired of waiting for the updated version. Well, the s939 adapter is completely faulty and cannot be used in its original state. I lost a few hours trying to make it work, tried different backplates etc. In the end, I was able to install it using a piece of paper (!) and Zalman's (!!) system that I had left after removing my previous the cooler, the CNPS-7700Cu. If you do not have decent DIY skills to come up with alternative ways to install it, I suggest you look elsewhere. I wonder if you could use this cooler as a passive cooler with a "normal" processor like the Athlon x2 4800+ or a similar watted Intel. That would be huge for those who want a completely silent system(like me).